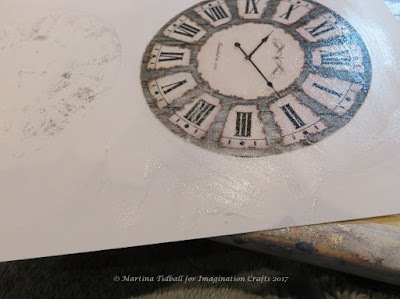 Using one of the gorgeous Rice Papers, I cut away a large vintage clock face and used MagiBond Decoupage glue to adhere it to some thick card. 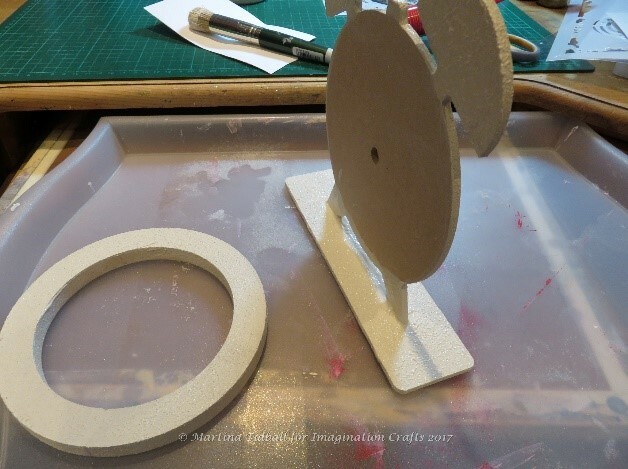 Once dry, I cut it out and stuck it firmly to the MDF clock base, placing the circular mount on the top: easy peasy! I looked in my craft box and found lots of odds and ends that I thought might come in useful on my final piece. 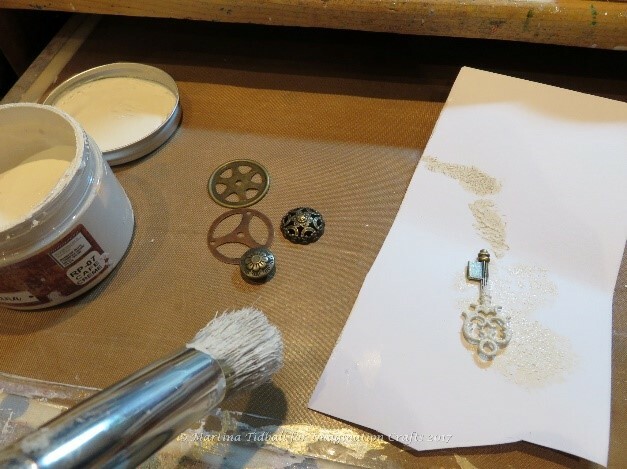 I coated each item with some more of the Rusty Patina and set aside ready to play with later. 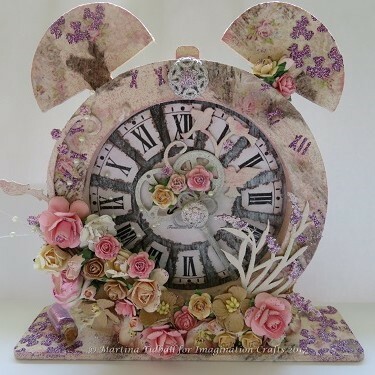 I wanted to add some more detail to the clock, so I added some more Rice Paper (featuring pastel roses) in small sections. 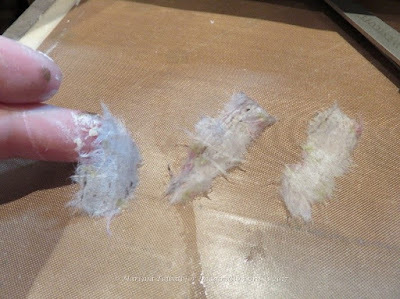 I added a small amount of water to the paper which allowed me to feather and tear the edges. Using more of the MagiBond Decoupage Glue, I adhered the torn sections all over the clock. To give the clock a vintage and pretty feel, I decided to have a trailing bouquet of flowers starting in the clock face. 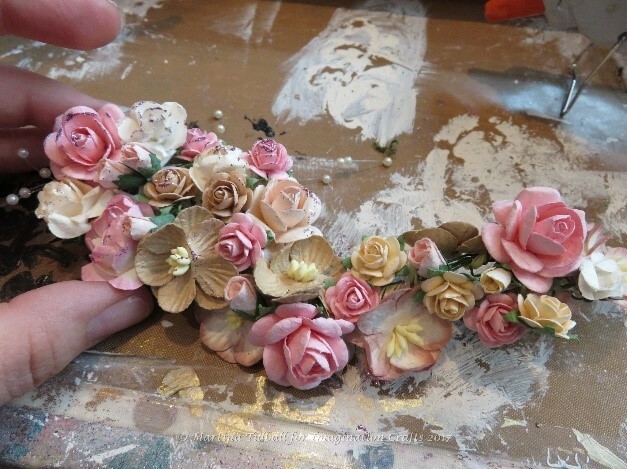 I used lots of wired flowers and accessories from my stash to create a bouquet, picking out the colours from the paint and papers that I had already used. 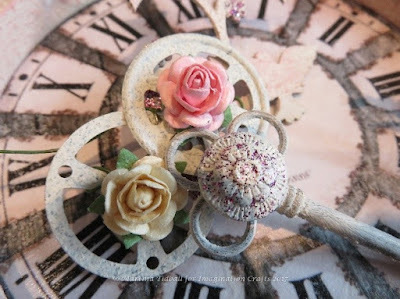 I also added a few flowers to a centre piece I created with the elements I had covered in Rusty Patina earlier. 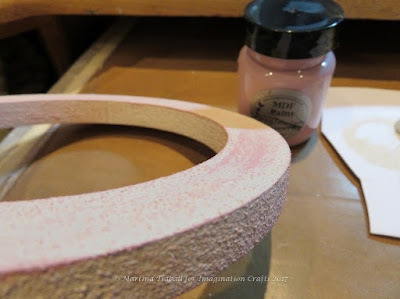 To add a little sparkle, I applied some of the Silver Rose Sparkle Medium with my finger. I decided to add some Wildflowers Art-Cutz at the last minute, so used some more Patina and Sparkle Medium to decorate them and tie it all in. I also added some Silver Rose Sparkle Medium through the Counting Cogs Art Stencil, placing the stencil over areas of the clock face and stand. Once all my pieces were dry, I started to arrange the elements until I was happy with them. I used hot glue to secure them all firmly. I hope you like it and I look forward to sharing another tutorial with you very soon.